So I’ve just returned home from holiday, and have been confronted with so much media coverage about the death of Cecil The Lion. Cecil was killed by American dentist Walter Palmer who is said to have paid $50,000 to kill her as part of a trophy hunt. Obviously this is heartbreaking and I’ve never agreed with trophy hunting, or hunting of any kind, but the thing I found most interesting was the reaction from some animal rights organisations, which involves looking a little deeper into the story of Cecil. The worldwide outrage surrounding the death of Cecil actually addresses another very different concept to trophy hunting – give an animal a name and people will sympathise. In this respect, it is a similar situation to the outrage over Marius the giraffe who was killed at Copenhagen Zoo in March 2014. Millions of animals that are killed on factory farms are not given a name, this is how we are able to view them as simply a commodity. Nobody can relate to a slaughterhouse full of thousands of pigs, but make a film about an individual pig named ‘Babe’ and you have a lovable character that is the star of a family classic. 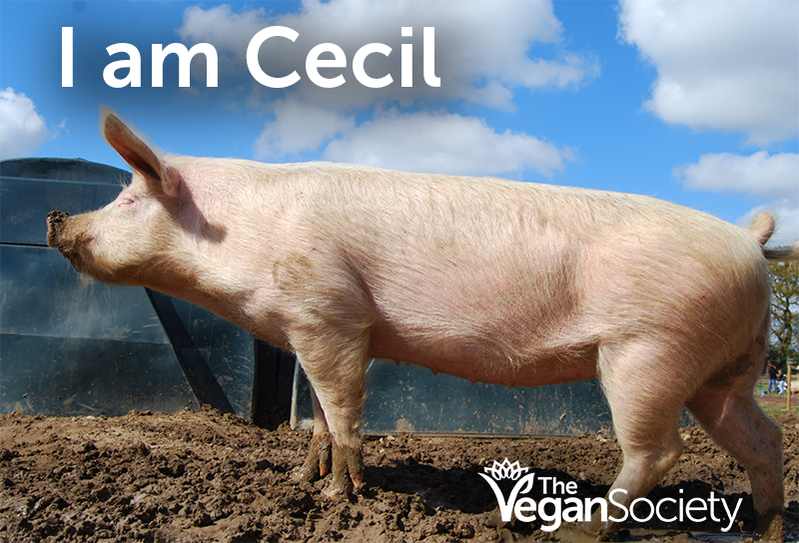 Animal rights organisations including The Vegan Society and Farm Sanctuary have acknowledged this idea that the animals living on factory farms are as much individual beings as Cecil, however their deaths cause no media coverage or national outrage. They then showed images of these animals with the caption ‘I am Cecil’. 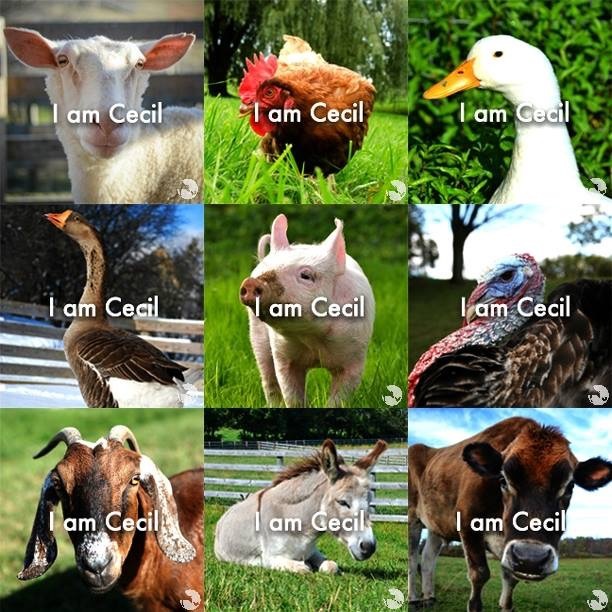 The following was from Farm Sanctuary, capturing the idea that Cecil is now more an idea than an individual lion. Any animal could be Cecil. Although what happened to Cecil was very sad and completely unnecessary, we can take some comfort in the hope that the media coverage of events such as these will hopefully encourage more people to make the connection between individual animals in the news and those we eat. ‹ PreviousCruel Tradition Finally Ended!